Located in West Bloomfield, TreeRunner Adventure Park provides you with the opportunity to test yourself in a safe and secure environment. By offering you the chance to get up high amongst the tree tops, it will give you a completely different sense of what it is like to be alive, but the fact that you are absolutely safe at all times means you can enjoy yourself rather than being anxious. The park itself is vast and with 12 different trails to choose from, it does mean you are not short of options. Also, it has almost 200 different obstacles, 41 different ziplines and also 6 difficulty levels so even if you are brand new to this kind of adventure, then there will always be something suitable. Furthermore, the team behind the adventure park have also now included a special trail for children between the ages of 4 and 7. This is designed to provide them with a taste of what’s to come when they are older and, once again, everything is done in a safe environment at all times. 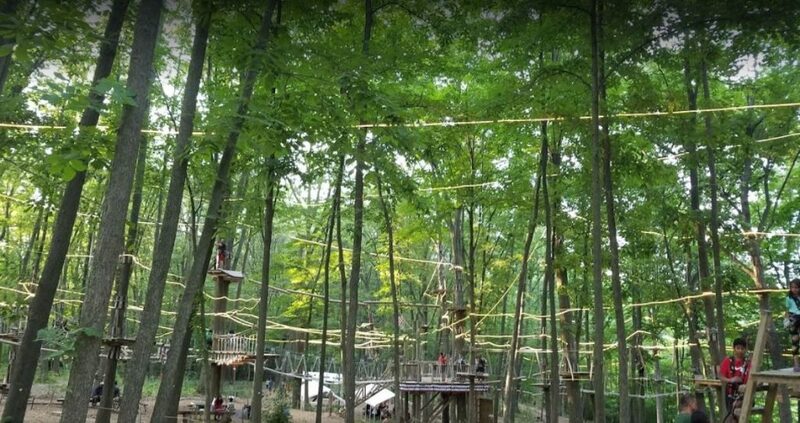 TreeRunner Adventure Park was voted the best in its kind across the whole of Michigan, and as soon as you step inside the park and see what awaits you, it will then become obvious as to why they won. You will also discover their absolute professionalism at all times, and that alone will boost your confidence in putting your safety in their hands. Their trails are available not only for groups but also individuals. It does get very popular in the summer months, so booking in advance is certainly something that is recommended in order to avoid disappointment. Finally, they are also big on the idea of eco-tourism. A visit there is certainly not going to have a negative impact on the environment unless you view having a whole lot of fun as being bad. Ultimately, if you want to try something new and exciting, then TreeRunner Adventure Park should then appear on your list of things to do. With so many trails and obstacles to check out, there’s a pretty good chance you will want to come back time and time again in order to test yourself and just see how brave you really are.